Third (more like twenty-third) time lucky for this post today. I appear to be experiencing technical difficulties with WordPress today. If you hear a high-pitched yelp followed by a loud crunching noise in approximately ten minutes’ time, that’s the sound of me booting my computer out of the window in a rage! Whilst the smaller one had already been unpacked, Aidan popped the big one out of Wanda the SuperBeastVanCar at about half ten at night; after we’d spend the entire day unpacking and identifying pottery from his latest trip. Needless to say, I was a bit excited by this one (I’m easily pleased) and it revived our flagging spirits no end. 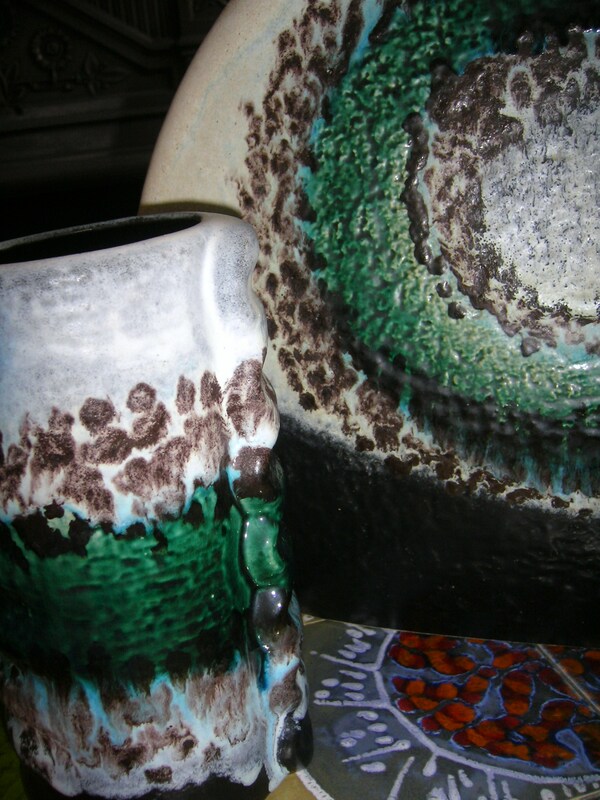 I love the glaze on these. The blue colour where the green and white meet is exquisite. They’re so big too. 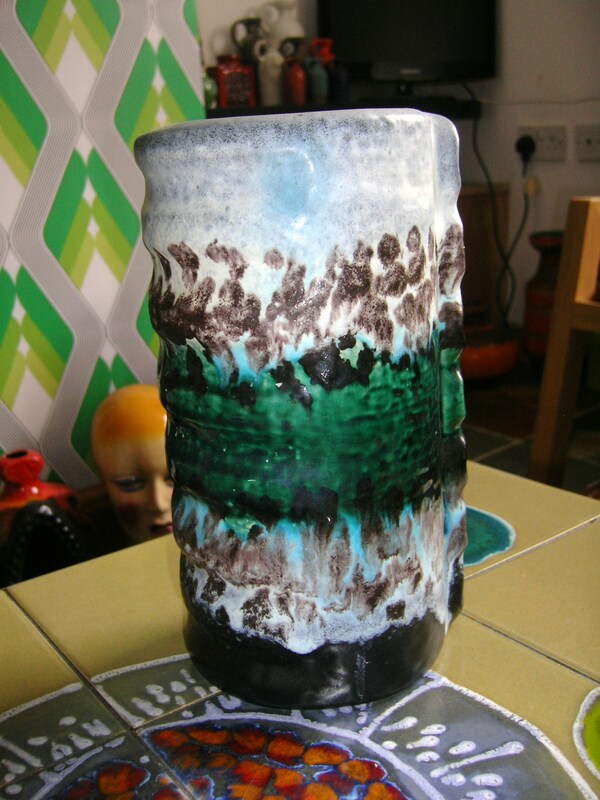 Dümler & Breiden make some of the most ostentatious vases, in my opinion. 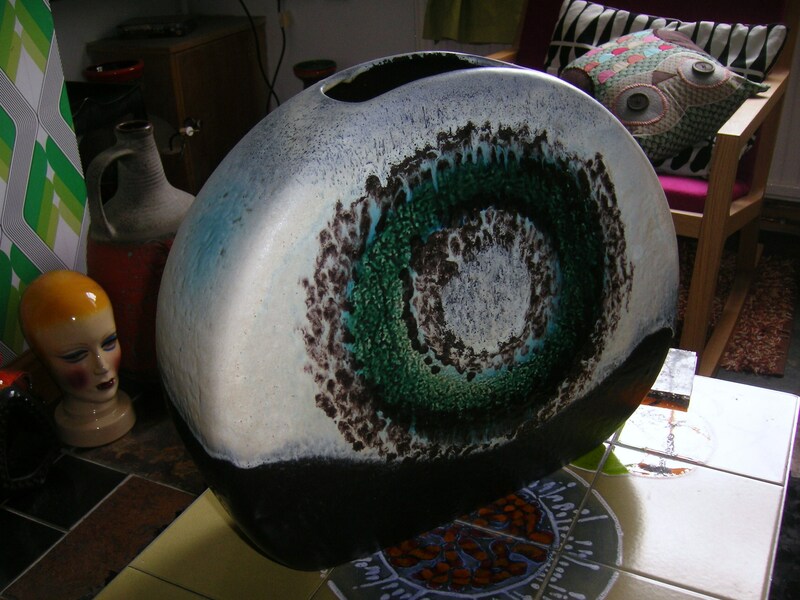 Some of our craziest pieces of West German pottery are by them. 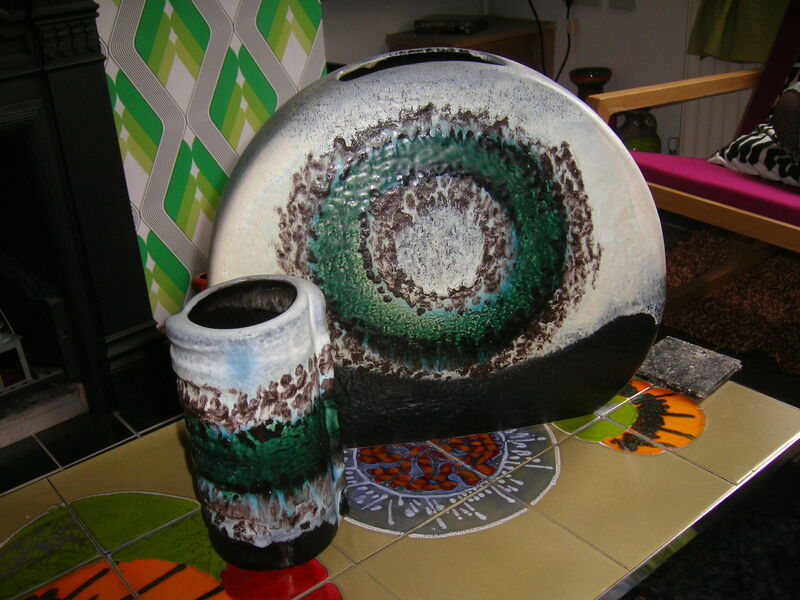 Whilst the glazes may not be as ‘Fat Lava’ as many new collectors would like, they’re both such striking pieces of pottery. This one is currently living on the hearth in front of the fire. It can’t really stay there, but there’s nowhere else for it to go. The house is bursting at the seams at the moment and Aidan heads off again on Tuesday to Germany for another pot-buying expedition. It’s madness! wow…cool pieces..we do not have any D&B pieces…they are quite unusual designs..
Well, I’m jetting out on Friday evening to Amsterdam, will spend Saturday morning sight seeing in Amsterdam then meet Aidan for the exhibition in the afternoon. There may be some troedeling on Sunday morning…!